For the most part dogs do only what they have been taught to do, or what they get pleasure from doing. 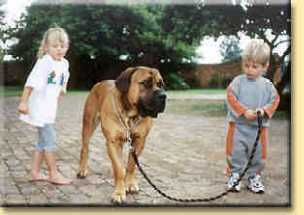 The handler, not the dog, is responsible for the dog's good or bad behavior. You are in the waiting room at the Vet. The door opens and another dog comes in. Your dog leaps out from under the chair and starts barking furiously. You pat your dog and say "there, there, don't worry, be a quiet little dog". Or: You take the dog in the car and he jumps around crying and performing. You say, "shame, quiet down now, don't be afraid". Likewise, you find a doggie land mine on the carpet, and you call him and smack him, or you find your best shoes chewed up and you call the dog and smack him or yell at him. Obviously after a few such incidents the dog will think twice before responding when you call him. Thereby you are UNINTENTIONALLY training your dog NOT to come when you call him. If you have to call your dog for something unpleasant such as giving him medicine, or bathing him, first of all praise him for coming and then give him his tablets, that way you won't teach him not to respond when you call him. When your dog doesn't perform well during training, ask yourself "how did I teach my dog to do this incorrectly?" Or if he suddenly starts making mistakes in an exercise, which he previously always did correctly, ask yourself "how did I confuse my dog?" Remember that if you allow your dog to perform unwanted behavior repeatedly without correction, he naturally assumes that you approve of it, and therefore carries on. BAD BEHAVIOR MUST BE NIPPED IN THE BUD BEFORE IT BECOMES HABITUAL. A handler, who repeatedly issues increasingly louder commands, teaches the dog that it isn't really necessary to obey until his master's voice reaches full crescendo!!! CONSISTENCY It is most important to be consistent in your training. Don't give your dog an old shoe to chew if you don't want him to chew your new shoes. Don't allow him to jump up when you are in your old clothes if you don't want him to jump up when you are dressed in your best clothes. He doesn't know the difference. Don't allow him on the furniture if you don't want him to jump on the furniture after he comes in all covered in mud. Don't feed him tidbits at the table if you don't want him to beg from the dinner guests. If he does something wrong, make sure you let him know he is wrong, each and every time he does it. If he doesn't sit straight, don't praise him, correct him into a straight sit, and then praise him. How is he to learn to do something correctly if you praise him when he does it incorrectly? How is he to learn not to pull on the lead if you correct him only occasionally? People who are not consistent in their training confuse their dogs to the point where the dog doesn't know what you want him to do. If you are truly consistent in your approach to your training, the dog will learn far quicker and will be one hundred per cent sure that what he is doing is what you want him to do. Think of the examples given above in UNINTENTIONAL TRAINING and CONSISTENCY, and then ask yourself how many other similar incidences apply between you and your dog.